Bryan Schreiner, Jack Zhang and Lucinda Wood. The following is an excerpt from an article on the Saskatchewan Research Council’s (SRC) blog, From the Lab to the Loading Dock. Read the full version at www.SRC.sk.ca/blog. Lithium, the lightest metal on earth, has numerous applications, ranging from lubrication grease and glass fabrication to rechargeable batteries that power many electronics and electric vehicles. The demand for lightweight, rechargeable lithium batteries has increased significantly as markets grow for mobile devices, electric vehicles and renewable power storage. The typical sources of lithium are hard rock deposits, sedimentary deposits or formation brine deposits of saline groundwater (salars). Salar brines are underground reservoirs that contain high concentrations of salts, including lithium, potassium and sodium. Downstream processing technologies for brines can be more challenging than traditional hardrock processes because of unit operation complexity and generally high energy and water requirements. Each brine also requires a unique processing sequence that needs to be developed and piloted. 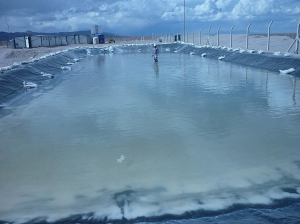 Traditional processing for brines involves pumping the brine from wells to a set of evaporation ponds where the lithium (and often potassium as a by-product) is concentrated. The concentrated brine is then subjected to a complex series of impurity removal steps to produce a lithium salt (e.g., hydroxide, carbonate) product that is typically not at battery-grade purity – this requires additional purification. Mining companies face numerous challenges when recovering lithium from brines. The ponds are capital intensive, and solar evaporation can take 18-24 months depending on climate conditions. Lithium containing brines are also composed of numerous minerals, including undesirable elements such as magnesium, that need to be separated until only lithium remains. Conversely, brines also contain desirable by-products such as potassium, which can potentially increase the economic value of the deposits if they can be recovered. Another challenge is the lithium concentrated brine undergoes a series of processing steps that involve significant heating and cooling stages, which contribute to high energy and water consumption. SRC is working with mining companies to develop lithium recovery processes from various sources to produce battery grade lithium products, and also to pilot and test new lithium recovery technologies. They have the equipment, facilities and expertise to develop, optimize and test lithium recovery technologies from all sources – hardrock, clays and solutions (brine and produced water). They also work with clients to recover lithium from hard rock and clay deposits. To overcome the challenges of the traditional lithium recovery process, SRC is developing its own more selective and cost effective lithium recovery from brine technology. The successful implementation of this technology will significantly reduce the lithium production cost – both capital and operating – and make it easier to recover and produce battery-grade lithium.